So yesterday, I read a really interesting article that shows how the act of creating, sharing, and imagining stories actually increases our ability and aptitude for empathy. 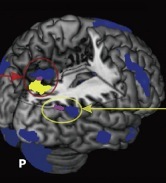 Below is an image of a brain that shows activity associated with emotional comprehension (in blue) and perspective taking (in yellow) when reading and simultaneously imagining a story. An Image of a Human Brain showing activation areas of empathy as stimulated by reading a story. Apparently, every time we read a story we activate a very complex network within the brain that not only allows us to visualize the scenario being described but intuitively “feel” the situation as if we were right in their shoes. Imagining someone in a specific place or situation requires our brain to work harder — activating a greater spatial network. The stronger the emotions evoked by the story, the greater the brain’s need to send signals throughout the body that create empathetic depth and complexity. It’s interesting if you apply this theory to development and specifically to reinforcement in education. It shows that there’ s an unmistakable emotional value to a powerful story. And the more stories that are shared with us, the more people, places and situations we ask our brain to imagine. Stories with greater complexity in character, plot depth and meaning can greatly affect not only the way we feel about those characters we’re imagining but people we will come into contact with after we put that book down for the day or leave that movie theater. Much like any other muscle or skill, the less exposure we have to great stories the greater the decline in our individual ability to accurately empathize with the unique perspectives, plights, and positions of others. What was the last great story you heard, watched, or shared? ~ by Dan Fabrizio on September 8, 2011.